From open savannah to rainforest, from dense papyrus swamps and brooding crater lakes to the vastness of Lake Edward, it is little wonder that QENP boasts one of the highest biodiversity ratings of any game reserve in the world. The park is set in the western rift valley and runs from the foothills of Mountain Rwenzori to the Ishasha border post in the south and covers about 1,978 sq km. The Park has a vast bird diversity of 611 recorded species, of which there are both endemic and migrant Albertine species. 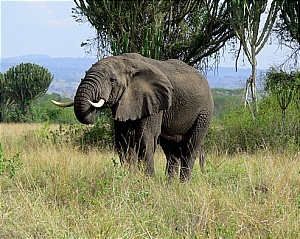 Access to Queen Elizabeth National park is by tarmac road from Kampala (420km) and the nearest town is Kasese (41km). The journey will take you approximately 6hrs of enjoying the different en route attractions like Mpanga forest for echo-tourism, drum makers besides the road, stopping over in Masaka to take photos at the equator, before reaching Mbarara one will go through L.Mburo and see some wild animals like the zebras. for visitors interested in flying to the national park, there are charter services and the nearest landing site is in kasese town and another one near Mweya safari lodge. Queen Elizabeth National Park is at its best after the heavy rainy seasons of March-April and October-November. The air is fresh, the grass green, and there is an air of spring time and renewal. However the area can be visited at anytime of the year. Please note that we also provide tailor made safaris and tours or expeditions to Africa involving cruises, visiting primates, sightseeing tours, adventure trails , mount trekking and trips to various safari journeys in Africa. We can help you plan for your perfect voyage or holiday vacation in the uncrowded destinations of Africa. 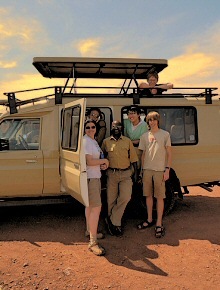 We make traveling and tours to Uganda and Rwanda memorable ! Get away with an expert Company!